This triple-4K dock for Mac, Windows and Chrome USB-C laptops helps you take productivity to a whole new level. With three 4K video connections, 100W Power Delivery, and 5x USB 3.0 ports, the USB-C dock is perfect for your MacBook, Dell XPS, Chromebook or other USB-C laptop requiring additional ports. 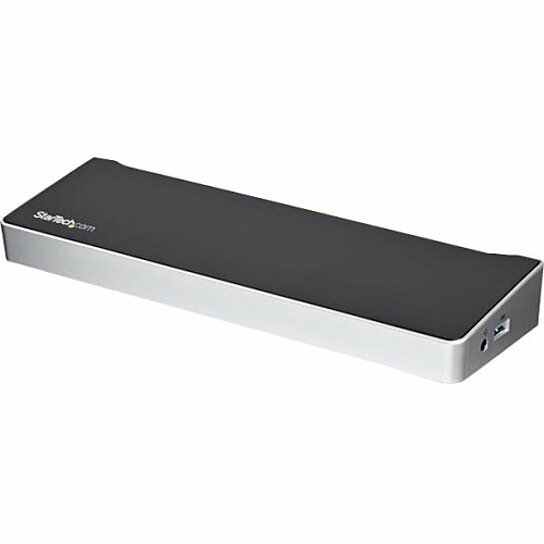 You can also connect the dock to your USB 3.0 laptop through a USB-A port, using a USB-C to A cable, such as the USB315AC1M(sold separately). Note: Power Delivery to charge your laptop is not available through USB-A, and only dual display is supported. For high-resolution applications, you can connect the dock to a 5K display at 60Hz, using the two DisplayPort ports. Using a single cable, the USB-C dock will power and charge power-hungry laptops, with up to 100W Power Delivery, and power your peripherals with its 150W power adapter. This triple-monitor docking station lets you transform your laptop into a full-sized workstation. It gives you five USB 3.0 ports (1x USB Type-C and 4x USB Type-A incl. 1x Fast-Charge port), a Gigabit Ethernet port, headset jack, and separate 3.5 mm audio and microphone ports. The TAA compliant DK30CH2DEP is backed by a StarTech.com 3-year warranty and free lifetime technical support.